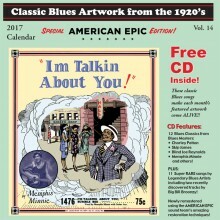 If your annual holiday gift to the 78-rpm collector on your list is the Blues Images calendar and CD, rest assured this year’s package is as good as ever. Blues Images paired up with the AMERICAN EPIC team for the second consecutive year to digitally restore the 78s included on Volume 14. The end result is not only the CD included with your beautiful new calendar. Songs restored for the CD will also be included in the AMERICAN EPIC documentary on rural American music from the 1920s and 1930s. The first episode of the series premiered at Sundance 2016. The series is scheduled to air on PBS and the BBC Worldwide in 2017. The care and skill applied by John Tefteller, Peter Henderson, and Nick Bergh during the digital transfer and restoration process is readily apparent when listening to the 23 tracks on the CD. Two recently discovered songs by Big Bill Broonzy – “I Can’t Be Satisfied” and “Western Blues” – are included alongside freshly remastered recordings of Skip James’ “Illinois Blues”/“Yola My Blues Away” (Paramount 13072) and Blind Joe Reynolds’ “Outside Woman Blues”/“Nehi Blues” (Paramount 12927). Tracks “How Long How Long Blues” (Jed Davenport), “Ain’t Gonna Lay My ‘Ligion Down” (Frank Palmes), and “Mr. Devil Blues” (Joe Williams) include acoustic blues harp for the harmonica player on your gift list. Other artists featured on Vol. 14 include Garfield Akers, Memphis Minnie, Charley Patton, Blind Leroy Garnett, Mobile Strugglers, Blind Willie Johnson, Blind Gussie Nesbitt, and Ishman Bracey. Consistent with years past, the calendar’s artwork features original advertisements that pairs with the recordings. Many of these advertisements, thought to be lost, were found in 2002 in Port Washington, Wisconsin by Blues Image owner and longtime collector John Tefteller. Additional advertising images were added to his archives in 2015, several of which appear in this 2017 calendar. 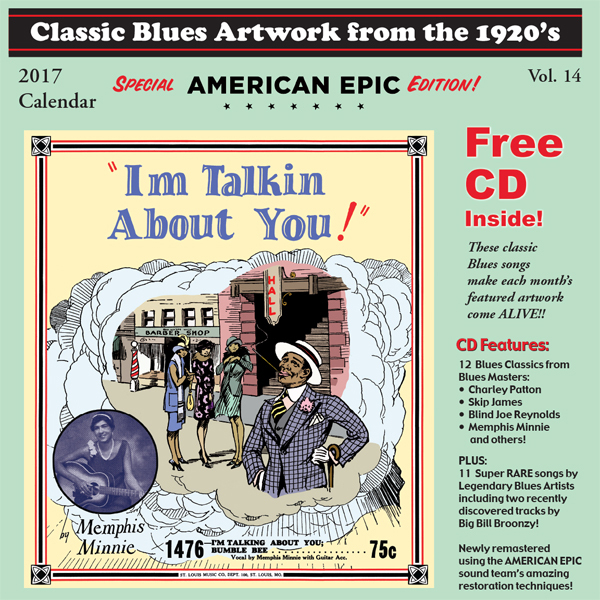 The 2017 calendar and CD are available at select music and book stores, several internet sites, and can always be purchased directly from the Blues Images website. 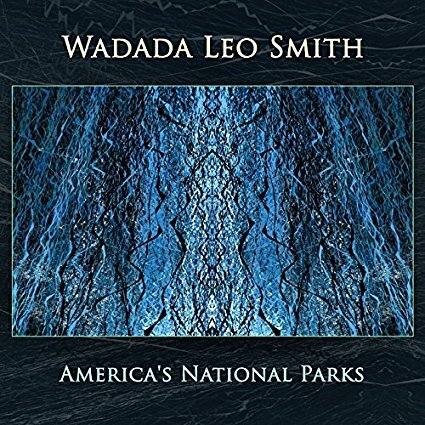 Wadada Leo Smith’s multi-movement suite, America’s National Parks, is a musical proposition for a more expansive and inclusive definition of who and what can carry the label as an American National Park. Spread out over six movements, Smith evenly divides his focus on pre-existing National Parks and sites and individuals that should be bestowed the designation of a national landmark. In this composition Smith melds “Ankhrasmation,” his self-designed graphic score notation with sections of composed and improvised music. Such an approach leads to thematic unity and cohesion within each of the movements while also providing ample room within each piece for the members of the Golden Quintet to shine. 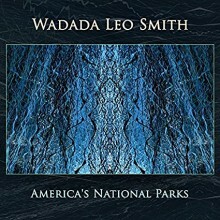 The addition of cellist Ashley Walters to the group for this recording provides Smith with a greater sonic palette and contributes to a soundscape and musical moments unheard before in his recordings. If there were one word to describe this recording, it would be sparse. The sparseness of the recording contributes to a sense of intimacy where one can envision each musician attentively listening to one another that in turn leads to moments throughout the piece of unique instrumental combinations and arrangements that emerge and grab the listener’s attention. The three movements based upon Yellowstone, Sequioa/Kings Canyon and Yosemite National Parks are all remarkable for the sonic visualization of the openness and majesty of these parks. Moments of note in these three movements include the simple melody played by pianist Anthony Davis and Smith in the opening moments of the Yellowstone movement, the loose and enveloping soundscape produced by the quintet that complements Smith’s extended solos in the movement inspired by Sequioa/Kings Canyon National Park, and the cool, icy playing of Smith that mirrors the glaciers of Yosemite. The three remaining movements, as noted earlier, take their cue from sites and individuals not formally within the National Park system. In “New Orleans: The National Culture Park USA 1718,” Smith proposes that the entire city of New Orleans, not just a specific location or a certain performance style, should be memorialized as a National treasure. Smith does not attempt to recreate the music of New Orleans per say, but rather alludes to the sounds of the city while never quoting them explicitly: from the movement’s opening with a bass riff similar to the chants of New Orleans Mardi Gras Indian tribes, to Smith’s blunt attacks and trumpet flourishes reminiscent of ragtime and early jazz, to the moments where pianist Anthony Davis’s runs can be heard as a homage to circum-Caribbean styles and genres. The second movement (“Eileen Jackson Southern, 1920-2002: A Literary National park”) takes as its cue the work and legacy of musicologist Dr. Eileen Southern In addition to being the first black female tenured professor at Harvard, Dr. Southern’s scholarly work greatly contributed to our understanding of the history and development of African-American musical practices in the United States. In what can best be described as an abstract call and response, Smith and the Golden Quintet demonstrate how this central practice to African-American musical culture, when placed in the right hands, produces a musical moment that extends beyond the categories and genres placed upon Black music and musicians. For the fourth movement, Smith turns his attention towards the murky waters of the Mississippi River. Smith does not celebrate how the waterway fits within the ethos, ecology, or history of the American nation, but rather points to the river’s dark history as a disposal site for black bodies. Smith accomplishes this through an episodic-like structure alternating with brief moments of silence. The musical interruptions mirror Smith’s idea that the disposed bodies float to the top and disrupt the flow of the river while also reminding us of the humanity of said bodies. 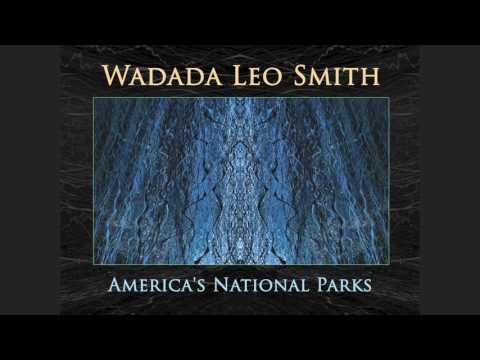 America’s National Parks offers a unique musical meditation on the idea of common property and memory and puts the full range of Smith and The Golden Quintet’s skills and talents on display. Alongside recent accolades, awards, and gallery retrospectives, this album serves as a superlative reminder that Smith is one of America’s most talented composers and performers active today. 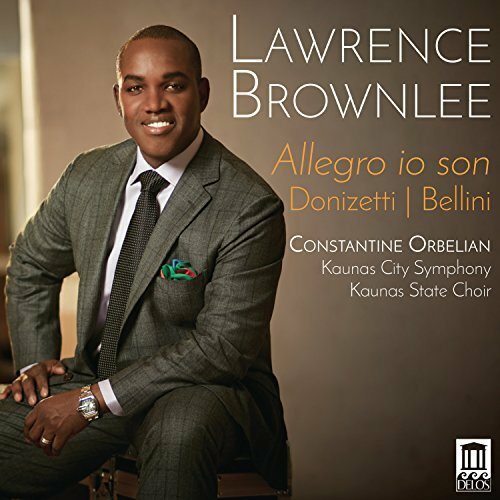 Lawrence Brownlee’s second release of bel canto opera arias on the Delos label—Allegro io son—is a welcome follow-up to the American tenor’s Grammy®-nominated album of Virtuoso Rossini Arias from 2014 (reviewed here). Once more he proves his rank as the leading proponent of this repertoire, consistently exhibiting rock-solid technique in spinning long legato lines, precise coloratura, and seemingly effortless high notes. Brownlee again has again joined forces with Constantine Orbelian and the Kaunas City Symphony Orchestra, performing both popular and somewhat rarely heard selections—from Bellini’s I puritani and Donizetti’s Rita, La favorite, Don Pasquale, Dom Sébastien, L’elisir d’amore, and La fille du regiment, recorded in Lithuania’s Kaunas Philharmonic in April 2016. Right from the beginning, he sets the tone with the joyful title track from Donizetti’s late (and rarely performed) one-act comedy Rita (or The Beaten Husband), tossing off B-naturals and C-sharps like they were confetti. In the selections from I puritani—what would be Bellini’s final work—Brownlee negotiates the unforgiving tessitura with unbelievably remarkable ease. In Arturo’s entrance, “A te o cara,” the tenor floats the long lines in the ensemble—with fine support from soprano Viktorija Miskunaite, bass Liudas Mikalauskas, and baritone Andrius Apsega—always maintaining the pulse, notwithstanding the slow tempo. Equally, in Arturo’s third act “Son salvo,” Brownlee conveys (as does Miskunaite) with directness and full-bodied tone. The two selections from L’elisir d’amore also are delivered in a straightforward fashion, without resorting to sentimentality, perhaps showing us that Nemorino might be more than just a “country bumpkin.” In both, he adds a little bit of ornamentation as well as mini-cadenzas that never distract from the character’s heartfelt declarations of love. The concluding two tracks are from one of Brownlee’s signature roles, Tonio in Donizetti’s La fille du regiment. The first selection, “Pour me rapprocher de Marie” is, according to the tenor “actually harder than ‘Ah, mes amis’—which you can sing if you have a solid high C—because it lies high overall and demands expressive phrasing.” He should know, because it is in this track, more so than any other on the disc, where Brownlee exhibits exactly why he is virtually peerless in this repertoire. Despite the slow tempo and flexible rubato, there is continuous forward motion even as he stretches the aria’s phrases to their limits, finally tossing off a C-sharp before floating a high A to pianissimo. In the final track, Brownlee dives headfirst into “Ah! mes amis” from the opera’s first act. His earlier version on This Heart That Flutters with piano accompaniment (from 2013, reviewed here) may have had a little more urgency, but with support from the orchestra, Mikalauskas, and the men of the Kaunas State Choir, Brownlee takes his time and sounds much freer as a result. And all nine of those high Cs are as solid as ever. Editor’s note: Lawrence Brownlee is an alumni of the Indiana University Jacobs School of Music, where he recevied his Master of Music degree.